This is the perfect gift for anyone who enjoys the occasional Indian take-away. Try it with chicken or ham sandwiches, salads and mature Cheddar cheese too. Slice the mangoes on either side of the flat stone. Cut away the skin and roughly chop the flesh, including the flesh clinging to the stones. 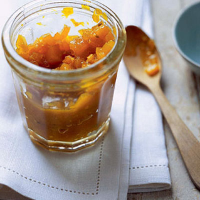 Ladle into thoroughly clean jars while still hot (wide-necked preserving jars, particularly those with metal lids or rubber seals and clip-top lids, are ideal). Finish with decorative labels. The chutney should be kept in the fridge and used within a week.